When I was somewhere between 2-3 in age, I must have hurt myself, and as all Mothers did, my Mum put Mercurochrome on that injury --only to discover that I was allergic to mercury! I ended up with mercury poisoning, and to hear her tell me the story way back when, it was pretty serious! All that I remember from that experience was that I was left on my own in a big room, in a hospital, with large windows and I was in a baby's cot. It was made of dark wood, and all I remember doing is trying to get out of there! There were nurses (I guess) but they looked like Nuns, and it appeared that I was in a Catholic hospital, (but of course I didn't know that!) In an attempt to make my hospital room more friendly, there had been a few stuffed animals put on the wide window sill of my room. So at one stage, after much maneuvering, I managed to climb out of my cot, and dropped to the floor, and of course proceeded to that window sill, in order to better inspect these rare treasures! 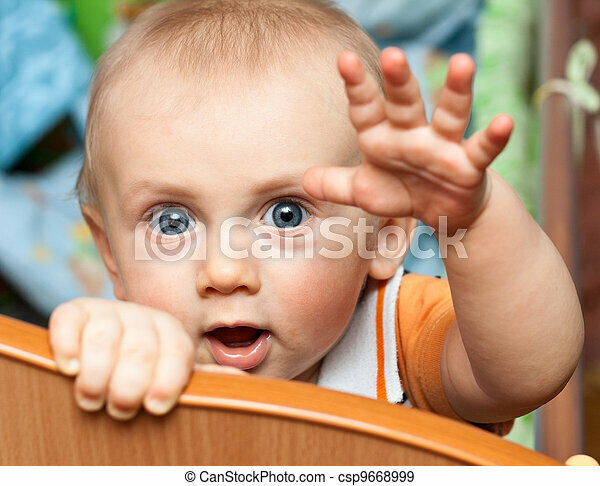 I climbed up onto the window sill, and started to reach for the toys, when the nun /nurses came into the room...they panicked and grabbed me, probably surprised that I was after all a crafty and very smart baby-"Don't fence me in sister! ", I thought as they grabbed me! This was apparently a trick I learned very early on in my own cot, and Dad and Mum had to keep trying to figure out how to keep me from escaping. Apparently I don't like the look of bars--good thing I have never been arrested or put behind bars--who knows what I would have done---but there I go again, getting off the subject--where was I? Oh yeah--well--what right did these nun/nurses have to show me the toys and not let me have them? Maybe this was a prison!! It makes me wonder if the window was open and there wasn't a screen--ooh! I could have fallen! But major pay-out to Mum and Dad for my death--why does my brain think this way sometimes! Because it does is the answer...I'm sure there must have been a window screen--so why did the nun/nurses panic? Too many law suits that month? Anyway, after that episode I was actually tied into my cot with a net over the top so that I couldn't escape..I was still alone in this room, and I still don't remember any toys to play with. I do remember trying to learn how to untie these nun knots--but they were tricky, and they had a few more years of practice at it that I did! Finally my Mum and Dad came to take me home, but do you know what I had to do before they could rescue me from this nun/nurse crazy house? I had to do a poo in a special potty. C'mon..a poo! Can you do a poo on cue? I'm rhyming and I don't even mean to! Hey! I was so young--but I was so determined to escape this nun/nurse place, that I must have obliged, after probably much inspection, and lots of discussion, my poo passed all tests ... so my poo and I were released and free to go home.